Hello to everyone listening in with us today, welcome to The Healthcare Scholar. We are not a podcast, but today we do have a very special guest interview. Joining us is Cassandra Ramos who is a nursing student at Chamberlain College of Nursing. She’s also a mother of two young children, one of which was born during school. At most universities, there are at least a couple of students who are parents, and it’s definitely a challenge to juggle both home and school. Today we will get the inside scoop of what life is really like to be a parent student. Hi Cassandra, wonderful to have you with us today, how are you? Hello good morning, thank you so much for having me, I’m so excited! Alright so let’s start with the typical dreaded interview opener. Tell us a little about yourself. Yes, well, obviously I’m Cassandra Ramos. I’m 28 years old, raised in Vegas my whole life, this is all I know. I’m married, I actually married my highschool sweetheart. We were homecoming dates and 11 years later we are married with two kids. We have a daughter, she’s two years old, her name is Madeline. And we have a son who’s name is Mateo and he’s three months old, and obviously he’s the one that was born during school. I think I can hear him in the background. Ah yes, actually he is in the background. He’s jumping around. Let’s see what else… So I actually grew up surrounded by the medical field. My mom was a nurse, my dad was a radiologist. So growing up they worked crazy shifts, like every holiday. They missed a lot of sports games and my theater performances and as a child, I really envied a lot of the kids who’s parents were present a lot throughout all of that. 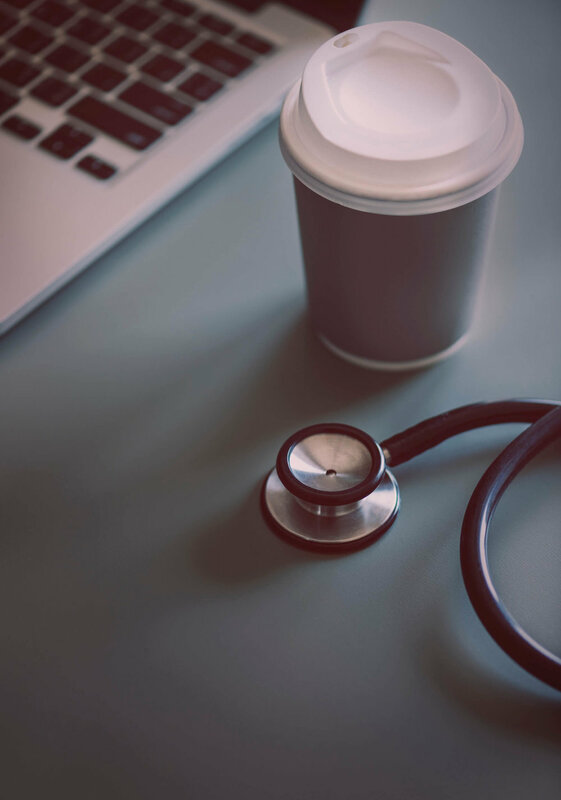 As I got older and I understood their careers a little bit more, and they told me a little bit more about what they do… That’s what actually sparked my interest to follow their path into healthcare. So that’s a little bit about me. That is really exciting to hear. It looks like you have a family in healthcare, so that’s what spurred everything on. And who knows, maybe your next generation will be healthcare professionals as well, it’s never too early to start training them. You mentioned having two parents in the medical field did not leave you much time at home, yet you’re in the medical field now. How do you feel about that, having those young kids do you feel they may feel a similar resentment almost at some stages of their life? I’m not scared, but I do know, y’know? Going into this career I did know that I was going to have to make a lot of sacrifices. And that my family would have to make sacrifices. But I think transparency is really important, and always keeping my family in the loop. Also when I do graduate and become a nurse, just letting them know that there are going to be some holidays that I won’t be there. Even if I’m at work I’ll be thinking about them. I just want to let my kids know that ‘yes, my patients are important to me, but my kids are the most important thing to me’. I think that’s just really important, with transparency and setting clear expectations. I think also being really organized and having a family calendar to let them know, at least during school, when I have exams coming up and when Dad is going to have to take over a little bit more than me. I think that will help too. And then I also think everything is a balance honestly. I have to balance out school time and family time. I don’t want them to feel neglected, but I do want them to understand that Mommy’s got to go to school, Mommy’s got to go to work. Luckily, since they’re both so young right now, I can introduce that to them at a young age. Hopefully that’s all they know, so they will understand what I’m doing and why I’m doing it. So does Dad stay at home or does he have another similar job? So my husband is a police officer, a very crazy job. He has very crazy days too, and he comes home tired. Being a police officer, you got to have high vigilance. He understands a little bit of it, since he’s usually first to arrive on scene. He’s seen a lot of crazy stuff, so he understands and he’s a really good support system. That’s great to hear, you guys have quite the team going on. So going through nursing school while managing a family, were there any unexpected obstacles that you ran into? Unexpected obstacles? I knew it would be stressful, but I don’t think I knew how stressful it would be. If you could see me you would see me gray hairs laughs. But honestly it’s just busy, there’s no downtime. When I’m not feeding Mateo, burping him, putting on a movie for Madeline, or making her chicken nuggets, cause that’s about all she eats right now... It’s just busy. I work really well under stress, and I’m really good at time management, so I make it work. I think I work better this way than if I had a lot of time, I wouldn’t know what to do. I think that’s just the biggest, a lot going on with two little ones at home, it’s just a very busy life. But again, that support system really helps. On days that I really need a lot of hours for studying, thankfully my mom, my nursing inspiration, she only lives five minutes away. She helps out a lot, and of course my husband on off days really steps up and jumps in there for me. Let’s go through what a typical day looks like: what goes through the life of Cassandra Ramos for one day? Usually starts by waking up every two hours because I have a very hungry newborn baby. He’s up every two hours, so that’s always fun, but usually get out of bed around six or seven. Mateo is up and at ‘em, doesn’t want to be in bed anymore. We come downstairs, coffee is first. Coffee is priority. And then I usually have a few hours before Madeline wakes up, so I try to squeeze in any studying or reading or just preparing for the next day. Then little miss Madeline wakes up; get her going with some breakfast and movies. Right now she’s into Moana, Peppa Pig, Paw Patrol. That’s her go to. Yes, and then Hubby wakes up around 12 we spend family time before he leaves for work. After he leaves for work, it’s just complete chaos laughs. So this is usually on my off day when I don’t have school, it’s just busy. By the time I feed Mateo, burp him, change him, I have about an hour before I have to do that all over again. But you know what they both take pretty good long naps, so I definitely squeeze in some school work during that time too. And Madeline is two, so she can pretty much entertain herself pretty well. And if not, I’m in the next room, so that’s about it. Throw in school work, throw in typical laundry, dishes, making lunch and dinner, and just busy. Very busy. Yeah, it sounds like you do it all. Both at home and at school. 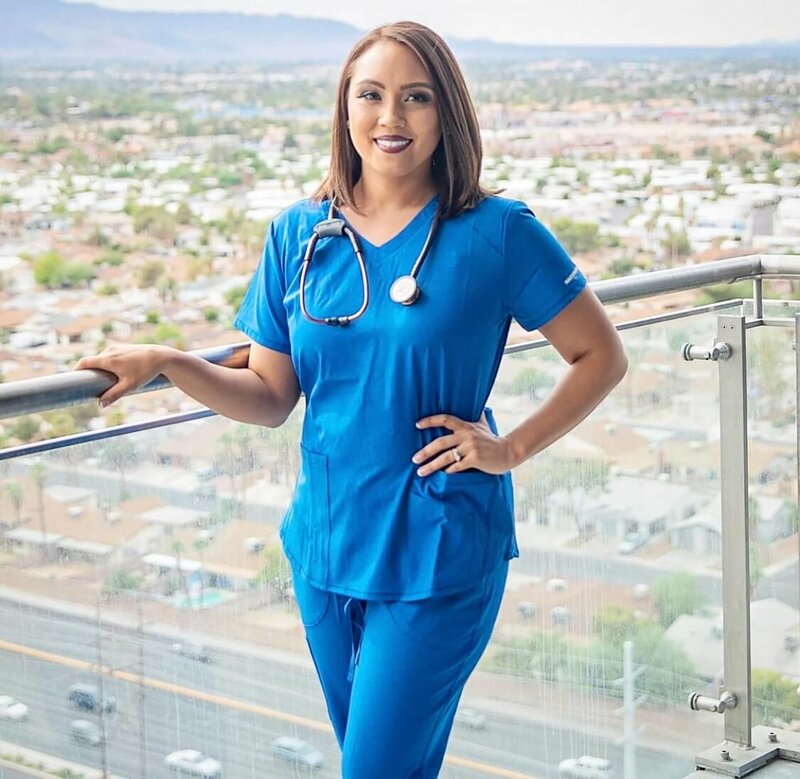 With so much of your time going into taking care of your family and just getting through the curriculum of nursing school, what aspirations do you have for yourself to become a nurse? What professional aspirations do you have? I would say I just want to be the best nurse that I can possibly be. I want to really be that nurse that explains what’s going on in my patient’s body, and what I’m going to do to make them feel better. I also just want my patients to trust me. I want them to be comfortable enough with me to ask me questions and I just want them to feel cared for and listened to. As far as what kind of nurse I want to be, I think it’s still a little early in my career to find out exactly what my calling is… but if I can kind of forecast it as far as where my passion lies. I really love labor and delivery, I love babies, I love pregnant women, and I think also I had really good labor and delivery nurses that created such a great experience for me. That’s the type of experience I want to give to my patients as well. Also, as of now, I really like the ER. It’s psycho, crazy, busy nonstop. I mentioned before I work really well under pressure, so I don’t know. We’ll have to do a follow up interview to see where I end up. Absolutely, I’ll reach out to you in a couple of years. You’re quite persistent, you have a psycho-crazy life right now, and you want to go for a psycho-crazy work. It’s very psycho, my husband says I have super powers, and I just make things happen. Coffee. Coffee! Wrapping up, any finals words of advice or wisdom for all the other parents or soon-to-be parents out there that are going through a healthcare school? I would say just mentally prepare yourself, mentally prepare your family. Set clear expectations with them as well. Have a really good support system too, because you’re going to need them. I’m the type of person that usually hates asking for help, but honestly I think part of my success has been being able to ask for help when I need it. That’s kind of out of my comfort zone, and also if the school allows it, I would say bring your support system to your orientation. Whether that’s your husband, your mom, your dad, whatever it is. I think that’s really helpful too, so that they are fully aware and fully educated of the chaos that you’re about to enter, and how much pressure you have. I think that’ll help a lot too. Really finding out what your stress reliever is, whether it’s the gym, or yoga, or writing in journals, or wine. Whatever it is. Family days. I love family days when I can just mentally check out from school work. We try to always have family night. We also have date night with just me and my husband. I think that really helps me, and that’s what works for me. And coffee. Alright thank you so much for interviewing with us. Sounds like Mateo is getting a little jealous of the time I’ve been spending with you. So I’ll send you back. He knows he needs mommy. Well thank you so much for joining us on The Healthcare Scholar. You are an inspiration to everyone in this field with everything you do, and I wish you the best of luck. Thank you guys for having me, and I would love to do a follow up interview when I graduate to see where I end up! Cassandra Ramos currently attends Chamberlain University College of Nursing. Her daughter, Madeline, is 2 years old and her son, Mateo, is 5 months old. Bridging Gender Inequities: Do We Care in Healthcare? We are taught in nursing school that all patients are individuals and that no assumptions should be made based off of disease, age, gender, etc. We must approach our patients with compassion and a longing to understand them and their circumstances. But is this emphasis on individuality also applied to us? Each person is an individual with a story. Take myself for instance. Had you told me three years ago that I would be halfway through nursing school, I would have called you crazy. I spent my whole life wanting to be an officer in the military. After a four-day hospital stay, my doctors discovered that I had suffered a transient ischemic attack (TIA), or ‘mini stroke’. I was left with my dreams crushed and curiosity about how this occurred. It was this curiosity that led me to where I am now. My path took me from Army ROTC, a male dominated world, to nursing school. In nursing school, I am one of only three men. In today’s age, a lot of emphasis is rightfully placed on female equality in the workplace. It is interesting to consider how men are treated in the opposite setting. I have had nurses warn me to stay away from certain patients because they refuse to be cared for by a male nurse. The first time it happened, I felt surprised and awkward. Thankfully, the nurses on the floor were all supportive, and I was able to move past it quickly. Yet why am I limited in my practice when male physicians are almost never barred from their patients? This is why respecting everyone’s individuality is essential. The real world isn’t fair, and I’m not going to be upset at my patients for discomfort around male nurses. The nurses and my professors were are supportive and understanding. I think that is the key to ensuring a positive workplace environment and culture. If all we did was focus on each other’s weaknesses, the workplace would become hostile. This is evident in the hospitals where you see certain employees exclude others, whether due to profession, gender, or simple dislike. I believe incorporating and respecting everyone’s individuality is the only way that we can ensure that healthcare is focused on working together as a team to serve patients. As a student, I thankfully have not had any major issues when it comes to being treated differently for being a male student. Yet people often mention how easy it is for males to get into nursing school. Since I am a student and not an admissions director, I cannot comment to whether or not this is a true statement. I do know however, that I was on the higher side of GPAs when compared to the rest of the cohort. Despite not knowing my qualifications or experiences, the assumption with almost everyone I talk to is that it was easier for me to gain admission. I do not take these comments personally, but it is intriguing when thinking about a male who failed our first semester, and it makes me question whether the rumors could be true. The other gender issue I see from time to time from afar, is when discussing whether there is a pay gap. I have read articles from several organizations that mention a pay gap between male and female nurses. Since I do not yet work as a nurse, I can not speak to personal experiences of any kind of pay gap. What I do notice in every one of these article is the arguing and lateral violence that occurs in all of the comment sections. It is surprising that even in a women dominated profession, men may still be paid more. Yet despite these imbalances, I hope that my peers won’t make generalizations about me when I enter the workforce. This again speaks to the pursuit of treating everyone as an individual so that we can better focus on the care of our patients.